This baked coconut sticky rice cake (aka baked Chinese New Year cake) is absolutely tasty. It's a no-brainer recipe. You won't go wrong if you try. I often bake this coconut sticky rice cake for Chinese New Year celebration recently. As Chinese New Year is coming around the corner, my daughter begins to ask me what I’m going to cook to celebrate. The first thing came up in my mind was this baked Coconut Pudding. My dear friend, Vivian who came from Malaysia baked one to share with us some time ago. I was impressed because it was so delicious. Vivian told us that her family would bake this coconut pudding to celebrate Chinese New Year in Malaysia. 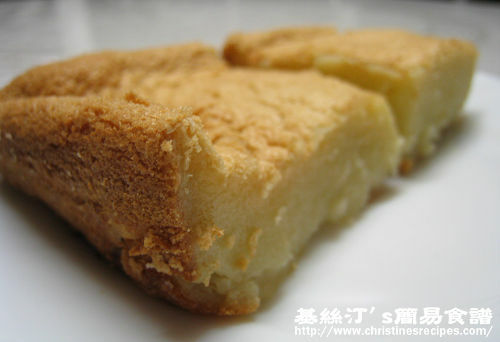 During Chinese New Year, Chinese people would make all kinds of cakes or puddings for friends. I have tried a steamed coconut cake that is very popular in Hong Kong. Honestly speaking, I like this baked one most. So I plan to bake one in the coming New Year season. The delicious taste, fragrant smell and chewy texture will make it a hit in my family for sure. Beat the eggs and mix with sugar very well. Add coconut milk and glutinous flour, and combine until very smooth. Use a 24cm x30 cm baking tray, or two smaller trays. Don’t use any trays that are too deep, it’s hard to cook through otherwise. Line a baking sheet at the bottom of the baking tray. Lightly brush or spray oil around the edges. Pour the mixture into the baking tray, bake for 50 minutes to 1 hour. Test it with a needle. If it comes out clean, it’s done. You can adjust the sweetness according to your preference. I used 400 grams of sugar. I think it’s best suit my family. This recipe makes a quite-big-coconut-pudding. I often used half of all ingredients that would make a pudding big enough for a family of four to six. In response to a reader's questions, I'd like to add the revised version for people who are interested in baking this dessert for thanksgiving as follow. I tried this recipe for Chinese New Year, but mine turned out very sticky and gooey, too wet. Also, in the oven, the top layer puffed up (like an air bubble)and after I took it out of the oven, it deflated and looked wrinkled. Do you have any tips? I halved the recipe and used 5 large eggs, 250 ml of light coconut milk, 250 ml of brown sugar, and 250 ml of flour. Thanks again! It's ok if you used half of the ingredients. But what was the size of the cake pan you used? Was your oven an conventional one? Probably it's because the heat of your oven was too high and made the surface of the cake puff up before the cake was cooked through. You might like to cover it with a foil next time. When the cake is done, remove the foil and bake the surface until brown. This recipe is like my grandmother's recipe. She made this when I was little and I haven't been able to find it since. Everything turned out well. Thanks for posting this recipe! Hi Christine, is it okay to use coconut cream instead of coconut milk? (Coconut cream is much thicker than coconut milk) And I am thinking of putting in freshly boiled red beans to the bake. What do you think? Yeah, I think it's okay to use coconut cream if you like. As you said, coconut cream is much thicker, so it would be better to add some water to balance the ingredients, I guess. Otherwise your cake could be too thick. But if you add some boiled red beans, you don't need to add any extra water to balance the thickness of coconut cream because the red beans have already absorbed some water in them, best of all, giving much flavour to the cake. Perfect balance. Your idea sounds fresh and tempting, Worth trying ! Is it because the pan is too small or shallow? Maybe I should invest in a new one and an oven thermometer too. Shall try this recipe again next time (and hopefully get it right)! I think it's because the temperature of your oven was too high, so the outside of your cake was burnt before the inside being cooked through. Next time, watch and don't let your cake be brown too quickly, turn down the temperature of your oven a bit. Thanks for your reply and tips! Sorry I got one more question, am I supposed to position the oven rack on the middle rung of the oven or lower? Put it in the middle rack of oven and bake. The temperature would be more even. I'm planning on using this recipe this Thanksgiving. The ingredients you provided are below. What size eggs are they? Is 10 too many? 500gm is that 2 1/2 glutinous flour and sugar? Also, what size do you recommend for a baking tray? I bought the Yi-Feng Gluten Flour do I use the whole bag? 17.5 oz(500g). I have one can of Kati Coconut cream is that the same is coconut milk? Can is 400ml is that sufficient? Sorry for all the questions...Please help and thank you very much! 1. Use any brand of glutinous rice flour. It will do. 2. You can use either coconut milk or coconut cream. Coconut cream is thicker and more aromatic than coconut milk. If you got 400ml Kati Coconut cream, use it, then add 100ml milk to compensate the difference. Add a few drops of vanilla essence to increase aroma. 3. As for the eggs, you can adjust and use less eggs, say 8 eggs would be good too. It won't change the texture and taste of this pudding. But the eggs will add more fragrance that you would definitely love. So use at least 8 eggs if you like. Use medium to large size of eggs. Mind you, this recipe will make a very big coconut pudding. I used half of all ingredients and a family of 4 can hardy finish it. haha..
Would it be safe to assume that you will have other dishes for Thanksgiving dinner? So I might suggest you to try the revised version. Use a kitchen weight to measure 300g. excellent blog! thanks for your recipes! This recipes looks fantastic, however, I have to wonder if some of the sad results are from a confusion of metric listings and conversions. Could you please translate these amounts and sizes to English? Thank you. Also, you said above that you already listed the pan size conversion, but I cannot find that. Can you please repeat what this size is in English - 9 x 13? 12 x 15 (like a jelly roll pan? We weren't given much metric in our public education, our cookbooks or (mandatory) home ec classes. Thank you. Thanks for dropping by and love my recipe. The size of the pan I used was 30x25x3.5cm written in the section of "Notes". If you'd like to convert to "inch" measurement, no problem. Btw, whenever you come across any recipes that you need to convert from metric to English, it's easy. Just google it as this example. Hi Christine, I love your blog. So many yummy recipes! I have one question though: if i am going with your revised recipe do i still have to bake it for 50 mins? I'm guessing not since it is much smaller. The time of baking depends on how big and thick your cake is. If your cake is smaller, decrease the time accordingly. You can test it with a needle or skewer to see if it's cooked through. So excited to try this as I have not had this in years! Thank you for all your wonderful recipes. Quick question: When the coconut pudding comes out of the oven, what do you need to do in terms of it cooling? Leave it in the pan or take it out of the pan immediately or whatnot? Thanks again! Oh, this cake won't shrink too much. I used to let it cool in the pan. Found this english version of recipe for my kiwi friend but found the ingredient as.... 2 cans coconut milk (about 500 ml each) = 1000ml??? But in the Chinese version that I have tried many time is just 1 can of coconut milk. I'm also excited to try the revised version.. Thanks heaps Christine! My first try came out ok; made two. The outside is chewy and sticky and the inside is gooey. During back process, both formed grapefruit size bubbles. I turned down the heat but the inside took longer to cook. I used two circular baking pans. Any suggestions on how to prevent the bottom from being sticky and how to prevent future bubbles? As this coconut cake was made by glutinous rice flour, it's quite hard to get the middle cooked if the cake pan was too large or the cake was too thick. Try to use a large and shallow tray, it will help. I made this pudding for my family and they loved it! So now they want me to make more for Chinese New Year. If I need to bake 4 trays of the pudding at once, will the baking time be longer than 1 hour? Do I need to readjust the oven temperature? The baking temperature is the same while the baking time will be a bit longer. For baking 4 trays at the same time, you might need to rotate the trays for evenly baking though. 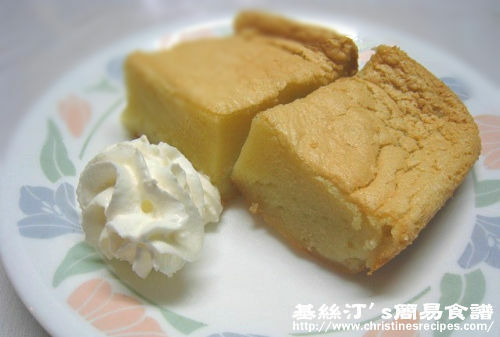 Hi Christine, can I made this pudding in advance let say about 2 days? This pudding is best served fresh from the oven. You might make it 2 days in advance. The look won't be good, as it will shrink back. If you don't mind, it's fine because the taste is still good. Thanks Christine for the reply. Hi Christine, do you know why the edges curl up when baking and why does my top have hard crust, and middle is just soft? Is the top supposed to be hard crusted? Thanks. seems that the temperature of your oven was too high.